Imported spec vehicle with 8 cylinder engine, grey interior and automatic transmission. 2012 Chevrolet with airbags (front and side), 4WD, alarm. Black with beige interior. Grey/Silver 2018 8 cylinder SUV/Crossover. Beige interior. It has power seats and keyless go. 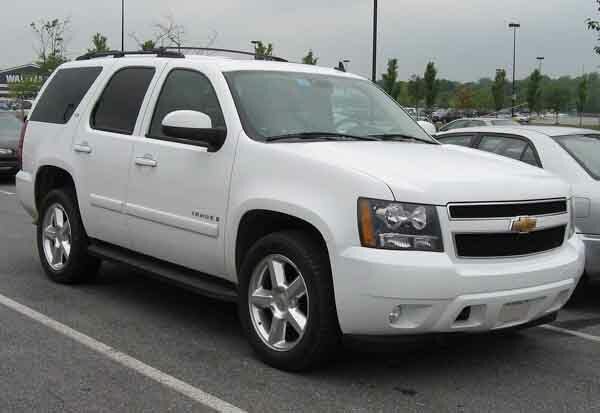 2015 Chevrolet Tahoe, price AED 123,000, white SUV/Crossover, brown on the inside with navigation system and CD player. 20″ wheels. 2016 Chevrolet Tahoe with features such as parking sensor rear, keyless go, air conditioning. It has beige interior and is Black. GCC spec. Imported spec, white 8 cylinder SUV/Crossover with beige interior. It has 4WD and tuner/radio. 2013 Chevrolet Tahoe, priced at AED 70,000, with features such as leather seats, power locks, MP3 interface. It has beige interior and is Black. GCC spec. 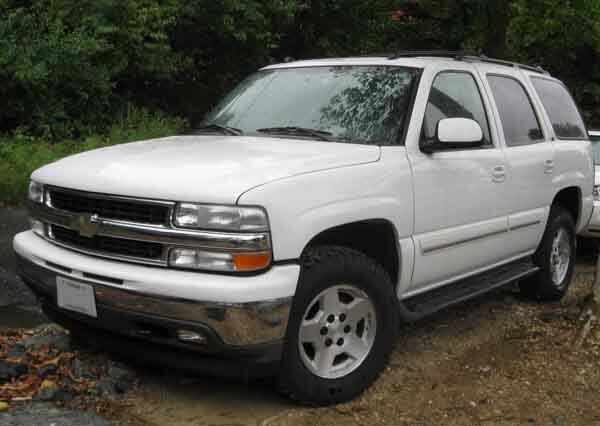 Hamza - I can’t fault my used Chevrolet Tahoe SLT, I’ve had it for years now, and it just won’t give up. I do have a second Z71 model too which is great when it comes to off-roading. Options aren’t the best, but I’ve put a new stereo system in. Pros: Offroad abilities, price and reliability. Saeed - I got my second hand import Chevrolet Tahoe LS at a good price online. Very comfortable cars on long journeys, lots of options inside to keep the family entertained and best of all the A/C is ice cold making it the perfect car for the UAE. Pros: Air conditioning, comfort and interior options. Abdulrahman - I looked for a seven seater SUV that’s not only comfortable but has a lot of power and looks. When the 2015 Tahoe LT launched in Dubai, I waited a few months to buy a pre owned one as it has everything I need. Safety is a top priority for anyone buying a car, and the Chevrolet Tahoe is one of the safest SUVs currently in circulation especially in 2015 trim. The V8 hiding underneath the bonnet is quite potent and offers plenty of horsepower and torque. Due to its popularity in the UAE and export markets, finding someone to buy your used Tahoe is relatively easy. Base models are driven by the rear axle, in top trim these cars are powered by all four wheels giving drivers more grip and the ability to hit the sand. Travelling from Abu Dhabi to Dubai frequently or enjoy long drives? The V8 of the current generation has excellent highway fuel economy. Named after a massive lake in the United States, the Chevrolet Tahoe shares its platform with the GMC Yukon and can fit five to seven passengers. Known for its safety, the Tahoe is loved around the world especially in the Gulf and US. Road Rivals: Ford Expedition, Nissan Patrol, GMC Yukon and the Toyota Land Cruiser. 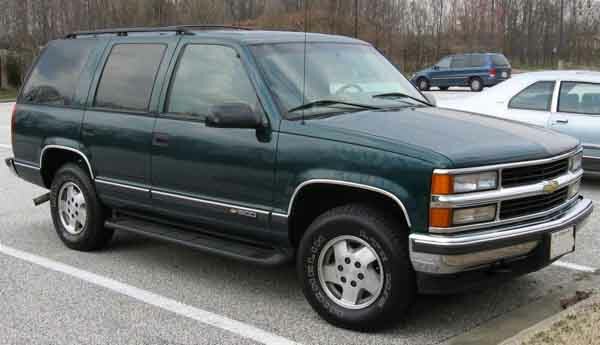 Making its debut in 1992, the Chevy Tahoe rolled out with a typical boxy shape that proved sturdy when it came to throwing the Tahoe around the desert, and the asphalt as that’s most are found nowadays. Stock features consist of fabric seats and manual accessories with additional extras including cruise control, FM Radio, air conditioning, sunroof, trailer coupling, roof rack and later on a CD player. 1994 models have drive side airbags, different exterior mirrors, revised steering wheel and various other interior options. Limited and Z71 joined the ranks at the end of the era. Both models are unique as Limited models sat lower to the ground, sported exclusive paint jobs such as Metallic Green or Blue, different bumpers, new shocks, five-spoked rims and various engine modifications. Unfortunately, these models never saw the light of day with only a handful of prototypes known to exist. However, these models did inspire the Z71 as it’s unique exterior pattern appears along with a host of exclusive colours, new trim pieces, 16-inch rims, black brush guard and plenty of modifications to the engine. Available as a two or four-door model and in various trims including LT and LTZ. Base models are driven by the rear wheels whereas four-wheel drive is available as an optional extra or standard on top trim models. Power comes from a V6 4.1-litre or a selection of V8 motors mated to either an automatic or manual transmission. Looking for a second hand Chevrolet Tahoe for sale in Dubai, UAE? Prices start at AED 18,000. In its second generation, the robust SUV sports a rounded shape noticeable at the front end and pretty much everywhere else. The interior also received a makeover creating a more desirable space to travel in. Stock and optional extras remained identical with air conditioning and CD player now available as standard with leather and power seats being made available to higher trims. In 2003, stability control, BOSE premium sound system and a rear entertainment package appeared as options. The V6 motor is no longer available with either a 4.8 or 5.3-litre petrol motor being the sole power choice. Rear-wheel drive is standard once again with four-wheel drive as an optional extra or standard on top trim levels. Manual transmissions fell to a similar fate to the V6 with automatic gears being the lone controller option. 2003 also show the two engines receive a boost of 10 hp. The two-door version is no longer available with four-door version left alone to carry the Tahoe name. Want to buy a pre owned Chevrolet Tahoe for sale in Dubai, UAE? Prices start at AED 22,000. In this generation, the Tahoe once again received a massive overhaul to both the exterior and interior. Forming into a larger vehicle with higher quality materials used inside. Options from the previous generations transition over again with base models fitted with manual fabric seats, power accessories and a CD player with space for seven occupants. Higher trims have cruise control, leather seats, fold down rear TV screen, power seats, Bluetooth, sunroof, media inputs and BOSE sound system. Numerous safety features are available throughout the years including rear parking sensors, multiple airbags, reverse camera, ABS, traction control and hill start assist. Z71 models returned and offered customers an enhanced off-road experience by raising the vehicle's height and adding exclusive suspension. Power is drawn from a single 5.3-litre V8 motor in GCC trim with import/export markets receiving smaller and larger displacements. Rear-wheel drive is standard with four-wheel drivetrains available mated to a single four-speed automatic gearbox. The V6 engine is upgraded to a 3.3-litre from the previous 2.7 and is now mated to a six-speed automatic gearbox. A four cylinder 2.4-litre engine is now available in the UAE also mated to a six-speed automatic gearbox and came standard with a front wheel drive layout with an optional all-wheel drive system. Want to buy used Chevrolet Tahoe in Dubai, UAE? Prices start at AED 45,000. 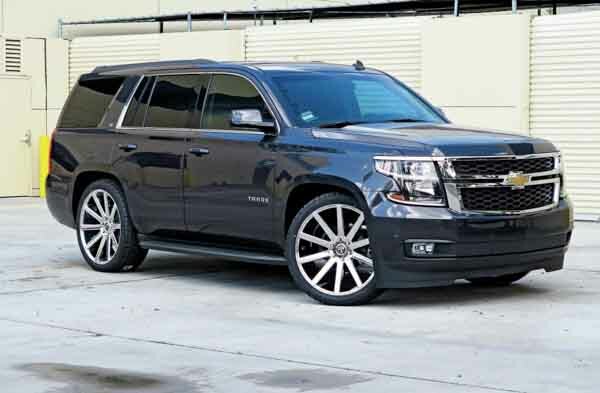 In its fourth generation, the Chevrolet Tahoe receives another design change and appears far boxy than ever before but a good looking box with its sort of rounded front end and flat rear, the interior also received a significant boost to accommodate seven passengers in comfort. Chevrolet uses stronger materials and innovative features to create the latest Tahoe that includes electric power steering, powered accessories, 12 mobile device charging areas, media inputs, leather upholstery, the 4.2-inch digital display mounted in between dashboard dials, 8.2-inch display with navigation and alloy rims on each corner. Safety features include adaptive cruise control, front park assist, front centre airbag, lane departure warning, lane change, assist, blind spot mirrors and an anti-theft system that can shut the entire vehicle down. All of the above features both safety and comfort aren’t standard and come at a cost. Again, a single 5.3-litre V8 motor is available in the GCC with rear wheel drive being standard and four-wheel drive as an optional extra across the three trims. A single automatic gearbox controls 355 horsepower. Looking to buy a used Chevrolet Tahoe for sale in Dubai, UAE? Prices start at AED 155,000.